WAREHAM, Mass. 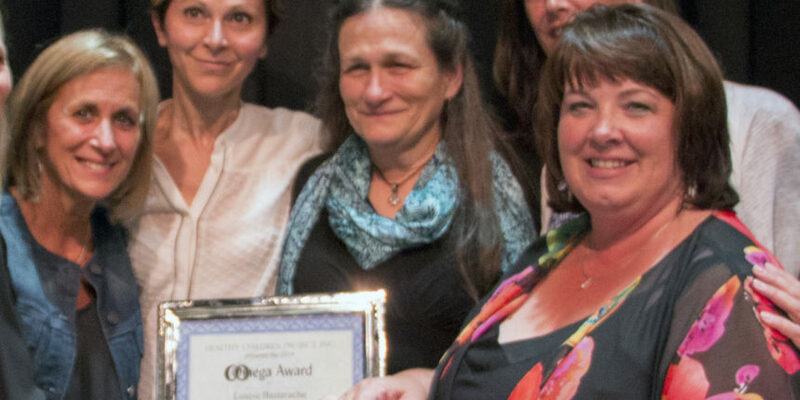 – Louise Racine Bastarche, CNM, longtime midwife at Southcoast Health’s Tobey Hospital, was recently awarded the Healthy Children Project, Inc.’s Omega Award, which celebrates significant achievement in protecting and promoting the health and well-being of women and children. Bastarche received the award at the Healthy Children’s Project annual gala, Decent Exposure, an Uplifting Evening Celebrating the Secret Lives of Breasts, an event promoting the health of women and infants and the awareness of the “coolness of breastfeeding.” The event was held the evening of September 11 at the Cotuit Center for the Arts in Cotuit, Mass. Dr. Ann-Marie Widstrom, international researcher, was also honored. The award has been presented to two people annually since 2013. Past winners include Massachusetts Senate President Therese Murray (2013); Judy Norsigian, co-author of Our Bodies, Ourselves (2013); Jill Tarule, co-author of Women’s Ways of Knowing (2014); and Jeanne Driscoll, co-author of Postpartum Mood and Anxiety Disorders (2014).